In which Cliff gets back on a throne. Drum throne that is. Yee-ha. Since I do have to drive on snow and ice once in a while, I bought myself a new (to me) four wheeled vehicle - a '99 Toyota RAV4. 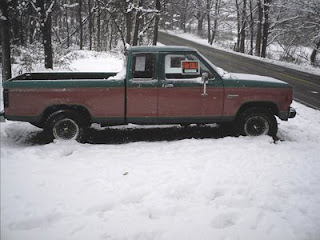 That left me with an '87 Ford Ranger - affectinately known as Zack. So I posted Zack on Craigslist and expressed my willingness to trade him for a drumset or a kayak. Michael and his drumset won. He got a winter truck and our house now has industrial noize making equipment. Only had my leetle camera at home, but here is my new throne. Julie and I went to a wine tasting/food event a couple of weeks ago. We found some really great wine and food from Michigan. Here are a couple of my favorites. http://www.grandtraversedistillery.com/ Hand made in small batches using ingrediants from the Traverse City area - wow, this vodka is smooth. Personally, I like the one with cherry in it - it finishes with a hint of chocolate. Yum. On a more practical side - do you like peanut butter? Or almond butter? A lady in Traverse City has come up with totally natural nut butters that are fantastic. What is really cool about them is the fact that they do not separate, so you don't have to stir them all the time. She calls her company Naturally Nutty. We have a jar of the vanilla almond butter in the cupboard right now. Fantastic - eaten on crackers, as a sandwich spread, or however you like your nut butter consumed. Just found something out yesterday - over the last few years the Big Three automakers (especially Ford) have been opening factories in other parts of the world. They want us to believe that they cannot be competitive building cars in the United States for people in the United States. If that is true, then how come Toyota has been steadily OPENING new plants in the United States to make vehicles to sell here and abroad? Depending on which source you consult, Toyota now has 12 or 13 manufacturing plants in various parts of North America. To my knowledge Toyota is hiring Americans to work at their American plants and they seem to be making money and NOT going to Washington with their hands out. I don't know a lot of the details, but Honda has plant(s) in Ohio that make cars and the big Gold Wing motorcycles. No one from Honda is looking for a check from Washington. Must be that no one told Honda and Toyota that kind of thinking will never work.